10 Young Women In American History Who Give A New Meaning To "Girl Power"
Admirable women are nothing new. Here's a list of a few young women who accomplished great things, no matter their age, gender, or race. This is, of course, not exhaustive, but just some stories I find fascinating. It was April 26, 1777 - Sybil was sixteen and living in Fredericksburg, New York when her father, a militia officer, was alerted that the British were burning Danbury, Connecticut. He had to wait at his home for the minutemen to arrive, so Sybil volunteered to alert the troops. She and her horse rode through the night, armed only with the stick she used to knock on doors and defend herself against highwaymen. In a single rainy night, she rode forty miles. When Sybil returned home in the morning, 400 soldiers were there, ready to march. They were able to fight the British back to their ships. Sybil was congratulated by her friends, neighbors, and General George Washington. There is a large statue of her in Carmel, New York and a few smaller versions elsewhere in the US. In 1975 she was honored with a postage stamp and, since 1979, Carmel has hosted a Sybil Ludington 50K race that runs approximately the same route she took. Emma Sansom watched all six of her older brothers march off to fight in the Civil War. Though young, she helped her mother and older sister run their small northern Alabama farm. On May 2, 1863, when she was 15, Union raiders tore through their home and burned the bridges over a nearby river. Confederate general Nathan Bedford Forrest rode by shortly after, asking for assistance in finding another path. Emma volunteered and rode miles through thick woods in the middle of a skirmish to show him a secret ford where their cows crossed. She returned home with bullet holes in her dress. Forrest was able to catch up with the raiders and stop them before they could destroy a vital Georgian railroad. Emma became locally famous for her bravery. General Forrest wrote her a note of gratitude, newspapers reported her adventure, she received a letter, plots of land, and a medal from the governor, and today has a statue and school named after her in Gadsden, Alabama. She was a young Lemhi Shoshone woman who became famous for assisting William Clark and Meriwether Lewis in their trek across America to find the Pacific Ocean (1804-1806). At the age of twelve, she had been kidnapped by a group of Hidatsa in what is now central North Dakota. The next year, she became the wife of Toussaint Charboneau, a Canadian fur-trader who lived in the village. By the time Lewis and Clark came around, she was sixteen and pregnant with her first child. Even so, she was a critical part of the mission. Alongside her translation and navigation skills, she rescued supplies from a river, traded horses with the tribe now headed by her long-lost brother, and emphasized to other tribes that this mission had a peaceful intent. In those years, she traveled thousands of miles between North Dakota and the Pacific Ocean with a baby strapped to her back. 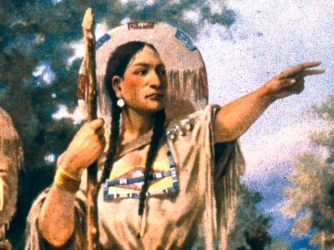 Sacagawea has too many honors to list here, including a river named for her, a lake, a ship, several peaks, many statues, and the famous Sacagwea dollar. 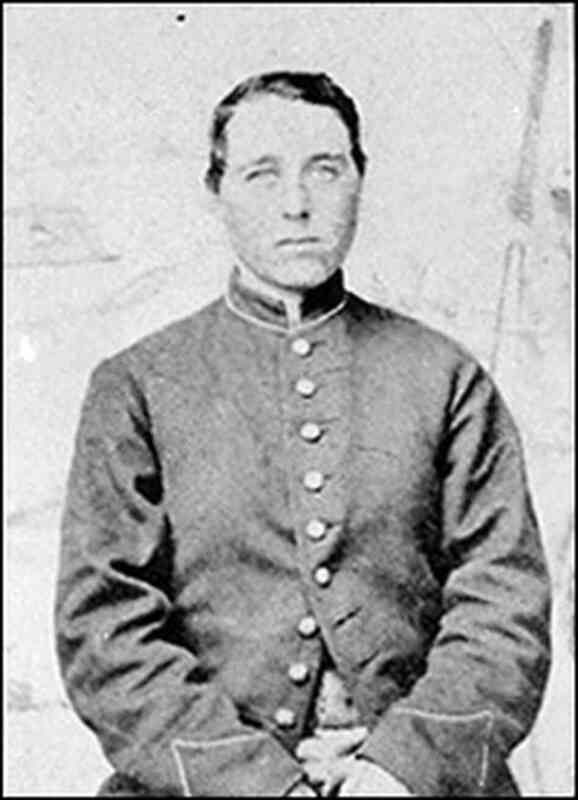 This image is not of Lizzie Compton, but of another female Union soldier, Albert D. J. Cashier (born Jennie Hodgers). There are no known photographs of Lizzie. She ran away from an abusive adoptive family (probably in Canada) when she was thirteen. She spent a year disguised as a boy working the steamboats of the Mississippi River before enlisting in the Union Army in 1861, at the age of fourteen. During her three years of service, she was wounded twice in battle and was paroled after being captured by Confederate Rangers. Every time her gender was found out, she would flee and join another regiment. After serving in approximately seven regiments, she agreed to dress in female clothes once more and served as a nurse for the Union Army. After 1864, Lizzie disappeared from history. A few newspaper articles were written about her, but that is all that is known. She served three years in the army and many officers had commended her, saying the only reason for her dismissal was her gender. Harriet was born in 1818 to Quaker parents in Massachusetts. Because the Quakers believed in equality of education for men and women, she was educated at her father's school and at home. Together, when she was twelve, they calculated the exact moment of an annular eclipse. She later became a teaching assistant and, at the age of seventeen, she opened up her own school. Harriet made the controversial decision to allow non-white students to enroll in her school, something that was not allowed even at the public school. The next year, she became the first librarian of the Nantucket Atheneum. She continued to pursue astronomy and, in 1847, discovered "Miss Mitchell's Comet." She was only the third woman in the world to discover a new comet and the first American woman. She was awarded a gold medal prize from the King of Denmark. Harriet was also the first woman elected Fellow of the American Academy of Arts and Sciences and of the American Association for the Advancement of Science. She later became the first professor of astronomy at Vassar College and Director of the Vassar College Observatory. Eliza was born to a British Lieutenant Colonel in Antigua. As a child, she was sent to an elite boarding school in London, where she discovered her passion for botany. When she was sixteen, the family was moved to South Carolina. That year, her father went back to serve in Antigua and her mother died shortly thereafter. While managing the plantation and caring for her three younger siblings, Eliza began experimenting with cultivating and improving strains of the indigo plant. After three years, she proved that indigo could be successfully grown and processed in South Carolina. She was able to make a profit in a very competitive market. Indigo became a massive cash crop for the colony, thanks to Eliza. She received honors for her agricultural work. In 1753 she got an audience with the Dowager Princess in Wales and presented her with a silk dress produced on one of her plantations. Forty years later, President George Washington served as a pallbearer at her funeral. In 1989, Eliza became the first woman inducted into the South Carolina Business Hall of Fame. Born in a log cabin in Madison, Wisconsin, Vinnie was lucky enough to attend Christian College in Columbia, Missouri. In 1861, when she was fourteen, the family moved to Washington, D.C. She became one of the first women employed by the federal government as a clerk in the dead letter office. She also sang at hospitals for wounded soldiers and collected materials for the Grand Sanitary Commission. At the age of seventeen, introduced to President Abraham Lincoln through a friend, he agreed to model for a bust for her. Vinnie was the first and youngest woman to receive a commission as a sculptor by the government, which she received the next year. The full-sized marble statue of Lincoln was unveiled in the White House Rotunda in 1871. Vinnie made more sculptures and became famous, even having some at the 1893 World's Columbian Exposition. She also designed the first free-standing statue of a Native American. The town of Vinita, Oklahoma is named for her. Phillis had a traumatic early life: she was kidnapped in West Africa and sold into slavery at the age of seven. Her luck changed, however, when she was purchased by the Wheatley family in Boston, who taught her to read and write. She was given a top education and, by age twelve, could even read Greek and Latin fluently. The Wheatleys did not force her to do domestic labor and instead fostered her writing talent. It was at that young age of twelve that she began writing poetry. Her works became famous, especially in Europe. She wrote for King George III and later General George Washington, whom she personally visited. Voltaire called her "the most famous African on the face of the earth." Phillis was the first African American woman to publish a book and the first to make a living from writing alone. She is featured on the Boston Women's Memorial and a building at Robert Morris University is named for her. Harriet did not have an easy childhood in nineteenth century Boston. Her father died when she was six, leaving her mother to support four young children on her own. After working a store for a while, Harriet's mother moved the family to Lowell, Massachusetts to run a boarding house for the textile mills. Harriet herself began working at the mills when she was ten years old. The next year, 1836, the mill workers struck over the increase in board charges. Even though the increase would have helped her own family, she proudly led the walk-out of the mills with so many other girls that the factory shut down. Her mother was fired over the strike, but Harriet eventually returned to work at the mills. She attended evening classes and left the mills when she was fifteen to attend Lowell High School. She went back to work later and participated in literary groups. As an adult, Harriet joined the American Women's Suffrage Association. After her husband died, she wrote several books to support herself and her children. She became an outspoken advocate of women's suffrage, both writing books and publicly speaking on it. She was the first woman to speak before the Select Committee on Women's Suffrage in Congress. Susie is a woman of firsts. Born into slavery in Georgia in 1848, she was sent to an illegal school run by a free African American woman. She was a voracious learner, even with the danger involved. In 1862, Union soldiers captured Fort Pulaski, which was near Susie's home, and her family fled to the army for safety. The soldiers were impressed by her ability to read and write and made her the teacher of the escaped former slaves. At just fourteen, she became the first African American teacher for former slaves to work in a freely operating school for them in Georgia. Later that year, she married a free soldier and moved around with the 33rd United States Colored Troops. Susie was the first official African American Army nurse, though she was never paid for her duties. She continued to teach freedmen for years after. In 1902, she wrote "Reminiscences of My Life in Camp with the 33rd United States Colored Troops, Late 1st S.C. Volunteers." Susie was the only African American woman to publish a memoir of her wartime experiences.